‘Halloween‘ makes a triumphant return to cinemas and comes full circle after 40 years since the original filmed premiered in 1978 to an unsuspecting audience. While the impact of the first film still resonates in Hollywood to this day, the new film makes a successful stab at introducing a new generation to the landscape and characters first seen decades ago. What if horror was not a ghost, or a werewolf, or a vampire, but a random stranger who attacks without emotion, without remorse, and without any obvious motive? A killer who kills and maims at random. A killer with an expressionless mask, who makes no grandiose speeches, and makes no apology for his mass murder. A silent killer who feels nothing, chooses to say nothing, and keeps on coming. A relentless monster simply referred to as ‘The Shape’. A creature who personifies evil itself. An evil that exists because you exist. And it will not die until you die. What if that evil was a reflection of humanity – humanity keeps masked and concealed? The mask worn by the killer, devoid of any emotion, allows the viewer to project their own fear, insecurity, paranoia, and even prejudice, onto a plastic mask. 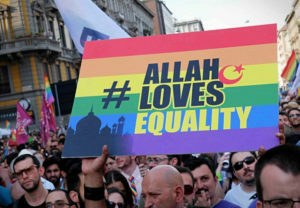 The horror sometimes is hidden deep inside the human mind, kept far away. The ‘Boogeyman’ is not some mythic supernatural creation designed to scare the children when they misbehave. The implication in ‘Halloween’ is that we are all familiar with the Boogeyman in some shape or form. In 1978, a low-budget Horror film was released in America that became a huge hit and went on to influence and inspire a generation of filmmakers. ‘Halloween’ was produced by Moustapha Akkad and directed by John Carpenter, and made a worldwide profit of $70 million, equivalent to about $277 million in today’s figures, and is listed as one of the most profitable independent films ever made. Over the years there have been numerous sequels, some receiving a positive critical reception while others were mauled by the critics, and in 2007 there was a ‘reimagining’ by director Rob Zombie which, despite being panned by film critics, went on to rake in around $80 million at the box office. The new film is produced by Malek Akkad, the son of the late Moustapha Akkad, and directed by David Gordon Green. In the prologue of the original 1978 film, the setting is Halloween night and the scene is the interior of a dimly-lit suburban house where a prowler is creeping around the rooms seeking the babysitter. 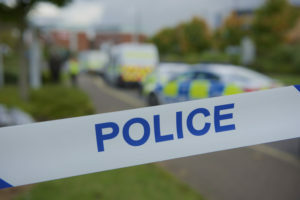 The scene is intense and atmospheric and grips the attention immediately. For the new film, the prologue goes in the opposite direction, the scene is brightly lit, it is daytime, and the setting is the outdoor enclosure of an asylum for the criminally insane. All the inmates are bound and restrained by a length of chain secured to a bolt in the ground with bold yellow lines painted on the tiles around them to caution the warders where to stand at a safe distance without being attacked by the prisoners who are taking their daily ration of sunlight. The scene is absolutely riveting, terrifying, and deeply unsettling. The tone is set, the opening credits roll, and John Carpenter’s original theme music ripples across the black screen. The film makes a direct nod to the 1978 film by using the same font and colour for the titles, and instead of placing a freshly carved Halloween pumpkin to one side of the screen, as the original did, in the new film the pumpkin has decayed and collapsed inwards, leaving a garish looking remnant of what was once a fresh and scary looking Jack-o’-lantern. Slowly, as the credits roll, the ruined pumpkin begins to reverse back to its former shape. A resurrection takes place as the Jack-o’-lantern begins to glow once again with a leering smile. And what a return it is. The film takes place exactly 40 years after the events of the first movie. 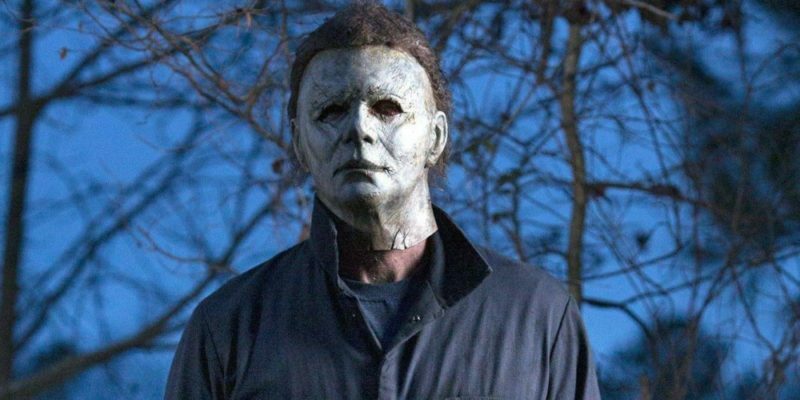 The Shape, known as Michael Myers, a deranged and cold-blooded killer who went on a killing spree on Halloween night, has been locked away and forgotten by society. The only people who remember him are doctors and journalists, and the one sole survivor of the massacre, Laurie Strode, a feisty teenager who used her wits to survive the attack by Michael Myers. She now lives a reclusive life on a ranch that looks like a high security compound with alarms, surrounded by an electric fence, and guns scattered around the house to ward off any prowler. News comes in that Michael Myers has escaped while being transferred to a new facility and he is coming home to the place where all the horror started. The small town is completely oblivious to what is coming on Halloween night. Only Laurie Strode understands the full horror that will be unleashed but no one, not even her daughter, will believe her. Hollywood has become obsessed with jittery camera angles, thundering soundtracks, bombastic dialogue, and outlandish scripts that defy logic or reason. It is almost as if film producers are scared that if a scene is held for more than a few seconds then the audiences’ attention span may lapse and begin to wander. 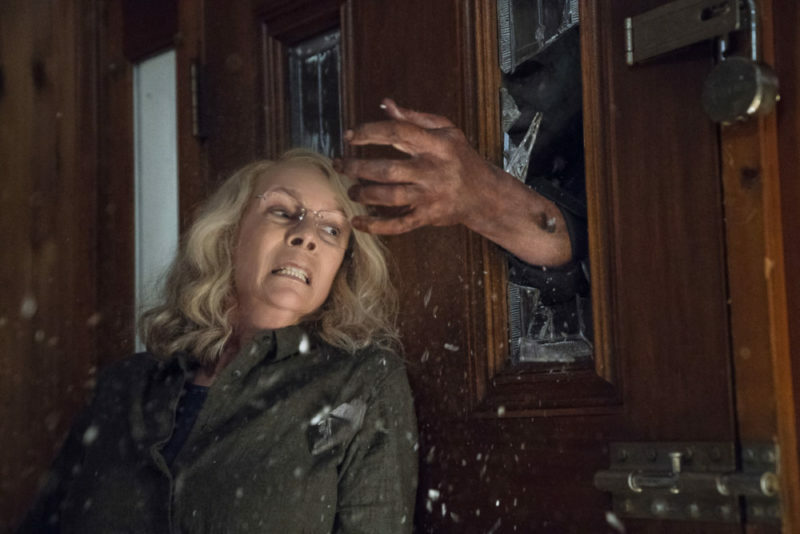 ‘Halloween’ dares to buckle this trend and returns to a style that is more sedate, and more reflective, and one that allows the audience time to engage with the characters. The pacing and editing is far-removed from the MTV-style montages that we now see in many films where action scenes are cut and edited so fast that emotional build-up is often dissipated or lost. The latest ‘Halloween’ employs cinematography which allows the characters to live and breathe, and their emotional states are translated very effectively to the audience. The stillness of the camera and the widescreen vistas create a genuine sense of unease and dread to creep into the frame. The lighting is exquisite throughout, using a subdued colour palette that emphasizes the autumnal hues of the story. This Southern Gothic story deals with age and the passing of time and the impact it has on the characters as they reflect on the past and prepare for what is coming. The art design of the film has a faded look and the textures are lined with erosion and age. The iconic mask worn by Michael Myers, which has become a popular Halloween trick or treat costume over the years, looks worn out and streaked with scars and lined with dirt. Time has taken a toll on human skin, characters have aged and look ragged, the plastic mask is frayed and peeling, and the town where the horror took place also seems decayed and mired in the past. There is a deathly pall over the film that never leaves the frame, even brightly-lit scenes are imbued with a haunting sense of loss. The new film has some very violent and graphic moments, but the most eerie and haunting scenes are where the killings occur off-screen, masked off by a wall or veiled behind a curtain, and the only sounds heard are those of the weapon being used and the victim gasping in pain. Sometimes, in several key scenes, the moment before a murder takes place is often more disturbing and tense than the actual killing itself. Unlike many of the pale imitations that followed in the wake of the original ‘Halloween’ to capitalize on the success of the movie, these slasher films piled on gratuitous and sexualized violence towards women that resulted in the ‘video nasties’ clampdown in the UK in the 1980s; which meant editorial cuts to films and outright bans on some titles. In this new ‘Halloween’ film, there is absolutely no eroticisation of murder. 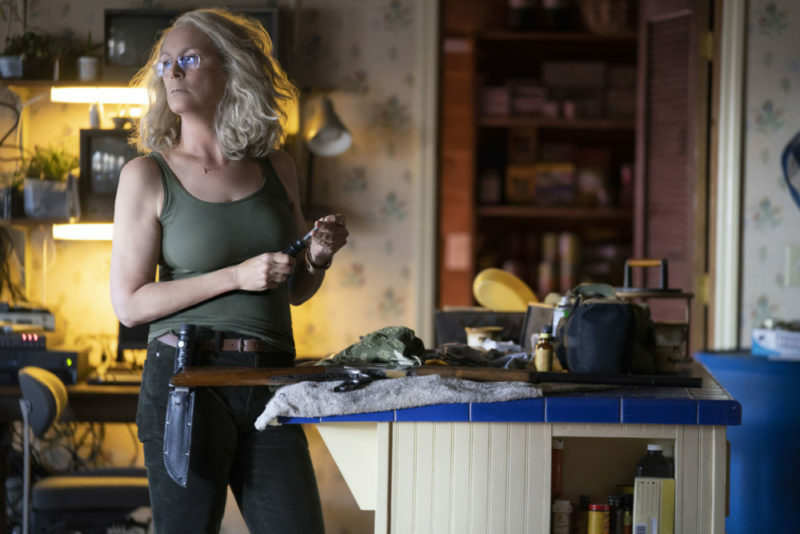 Jamie Lee Curtis – who played the part of the young babysitter relentlessly terrorised by Michael Myers in the 1978 film – is back and she brings maturity and steel to her role. She is no longer a screaming victim. She has overcome the darkness by training her body and mind to cope with the horror she endured as a teenager. In this film she shows grit and strength, and invests her role with a world-weariness that reveals wisdom and a stillness that enriches her character. 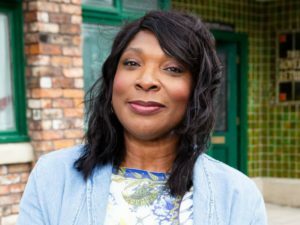 It is so refreshing to see older actresses being given an opportunity to play central characters, and also daring to see the reversal of gender by giving the traditional ‘hero’ role to a female lead. 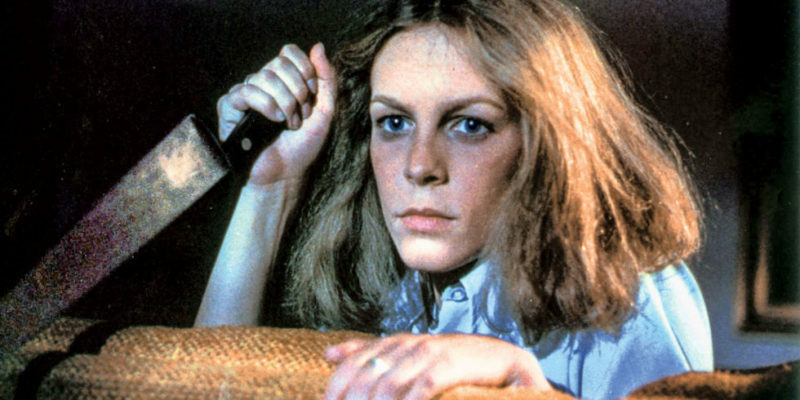 John Carpenter’s film gave a leading role to a female in 1978, but despite the success of the film and a strong performance by Jamie Lee Curtis, over the years there have only been a handful of mainstream Hollywood films that gave women leading action roles. 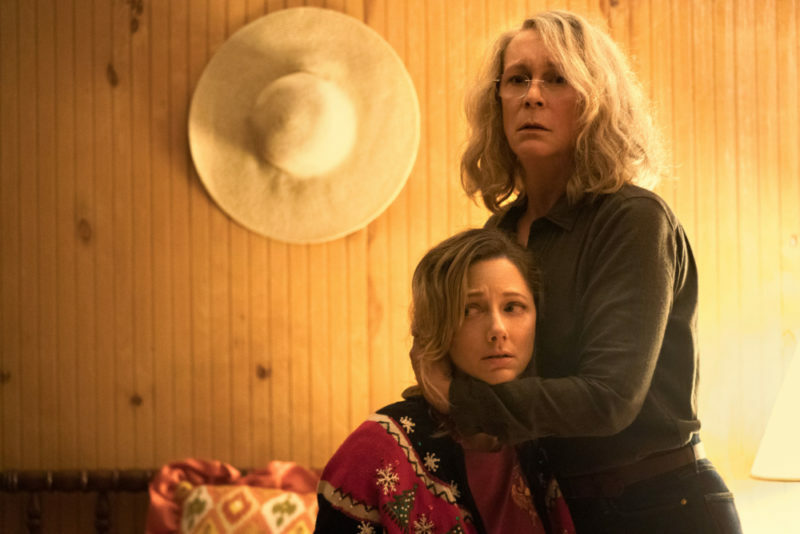 The new ‘Halloween’ reinstates this gender reversal by making a woman the central hero to the narrative. 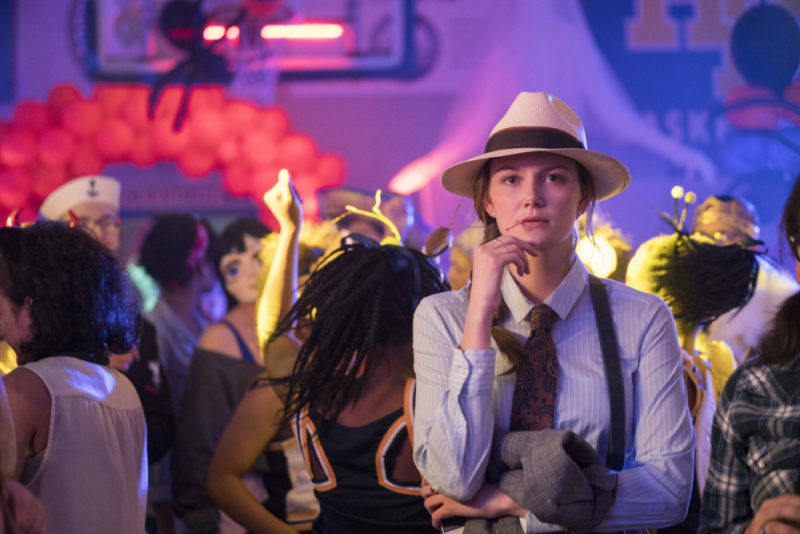 The script further indulges in the gender reversal theme by having Laurie’s granddaughter Allyson dress up as the depression-era gangster Clyde, with her boyfriend as Bonnie, for a Halloween dress party. Later, the boyfriend indulges in an indiscretion with another girl at the party, and is spotted. He quickly projects the ‘victim’ mode as he attempts to dig his way out of the betrayal, dismissing it as “nothing”. 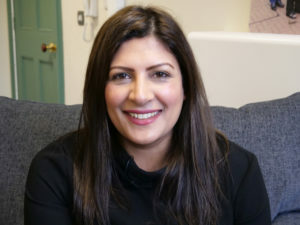 Challenging the notion of it all being ‘harmless’ or ‘just a bit of fun’ at a time when attitudes towards women in film are being turned on their head, this movie makes it clear whose side it’s on – the women. It’s also interesting to note that this film is co-produced by Miramax, a studio that was once run by the disgraced Harvey Weinstein, who is currently under investigation for his alleged sexual abuse. Miramax have bravely moved on and produced a film that gives dominance to the female characters. The women in this story are portrayed as strong, resilient, intelligent, and they need no men to ‘save’ them when they face peril. The gender politics have been given a fresh and exciting slant in this film. Touching on gender and politics, there is a remarkable scene in the film where the masked killer calmly walks into a house from the back alley, and then goes on to kill the occupant in a very cold and brutal manner. As he boldly leaves the house, through the front door, he pauses on the porch for a moment. He stands there like an emperor calmly surveying his kingdom despite the fact that the vicious crime he has committed is only a few feet behind him. An American flag is draped on the right side of the porch, and as Michael Myers steps down onto the street he once again momentarily pauses and his body becomes a silhouette. The outline is uncanny as he stands under the shadow of a tree. His bizarre shape and wig resembles the shuffling figure of Donald Trump. He watches as parents and children wearing Halloween masks dance and parade down the street with their candy baskets, walking past perfect picket fences and impeccably painted houses. The scene resembles a Norman Rockwell painting from The Saturday Evening Post. None of these picture-perfect Americans realize what kind of nightmare they’re walking into. This carnival of horror is a daring and provocative metaphor for the current political landscape of America. 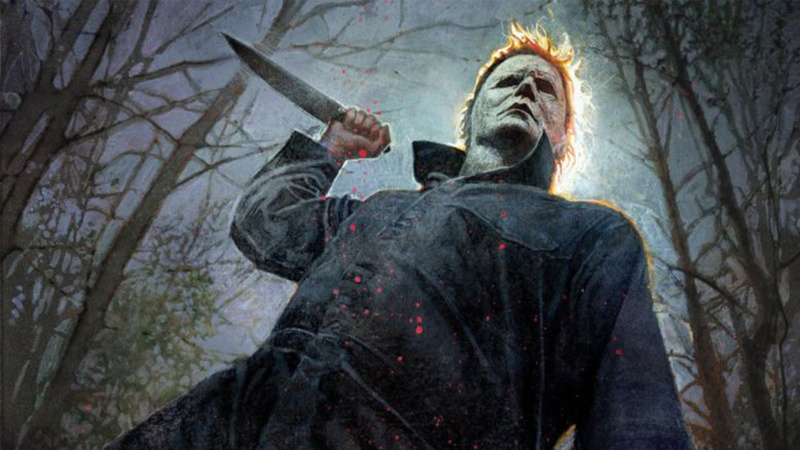 John Carpenter, the director of the original film, returns as an executive producer, and he also supplies the soundtrack which was co-produced with Cody Carpenter and Daniel Davies. The main theme from the original film is back, that sparse and minimalist theme still has the power to tingle the senses, and now there is an undertone and edge to it in several scenes where the soundtrack becomes discordant and snarling, without any clear motif or melody. There is an air of uncertainty as the music blends in the natural sounds of the surrounding environment and that marriage of music and ordinary sounds such as boots crunching on concrete or air rustling through leaves and over rattling branches makes for an unnerving soundscape. The film has so far proven to be a huge box office hit with current estimates of $110 million and counting. 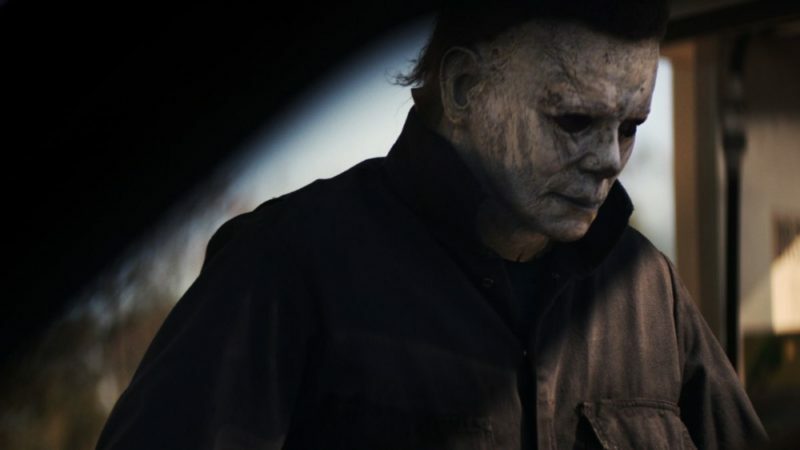 The script, acting, cinematography, direction, and atmosphere all show signs that this is a production that treats the audience with some intelligence, while the new story adds to the mythology of the ‘Halloween’ franchise. 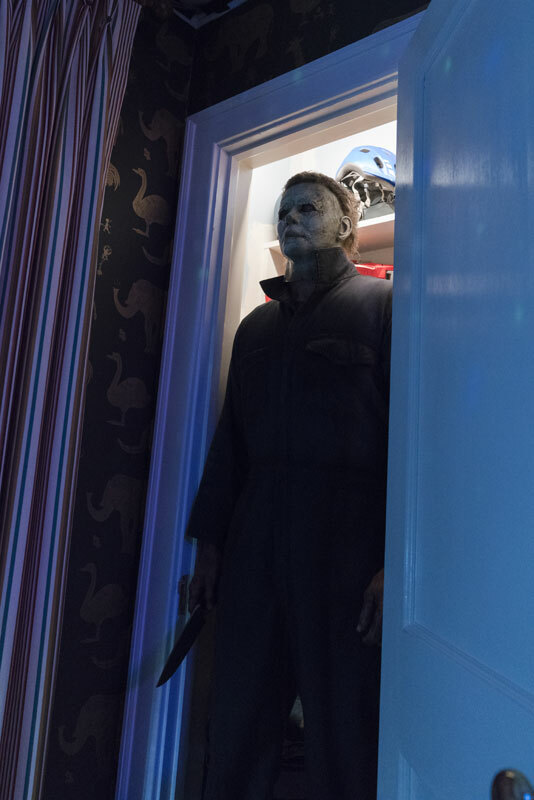 This film is an exciting entry into the ‘Halloween’ series, and it resuscitates and rejuvenates the Hollywood horror genre, which has become stale and clichéd. 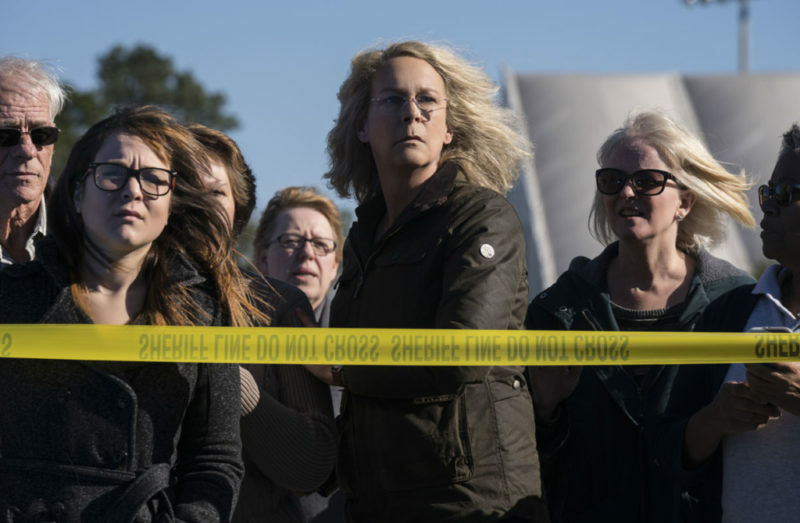 The women of ‘Halloween’ are no longer victims, they dare to control their own fates, and they dare to stand up to any man or menace.